Walton Career Services at the Sam M. Walton College of Business will host a variety of events this spring to help prepare students for career readiness through engagement with industry professionals, professional development skill enhancement and internship/job search strategy. 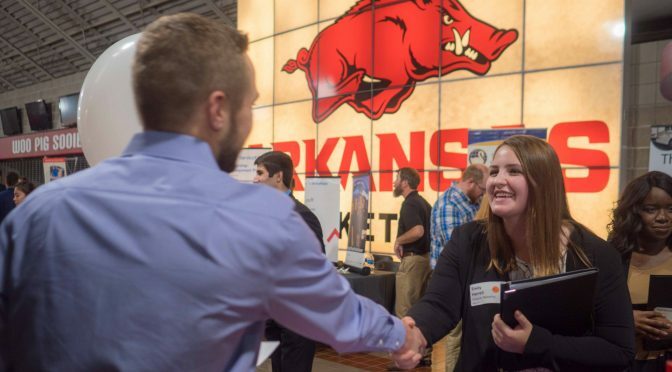 FIRST Little Rock Career Fair: Jan. 9, 3:30 – 5 p.m. at the Capital Hotel. Koch Industries – Company of the Day: Jan. 24, 9 a.m. – 3 p.m.
Cerner – Company of the Day: Jan. 30, 9 a.m. – 3 p.m.
Capspire – Company of the Day: Feb. 7, 9 a.m. – 3 p.m.
Schneider– Company of the Day: Feb. 14, 9 a.m. – 3 p.m.
Acxiom – Company of the Day: Feb. 21, 9 a.m. – 3 p.m.
Business Career Fair: March 6, 10 a.m. – 12 p.m. & 1 – 3 p.m.
Hilton – Company of the Day: March 14, 9 a.m. – 3 p.m.